Publisher's Weekly. Starred Review. Holy Crap. My publisher, Brett Savory, sent me a clipping this afternoon. It's from a rag called Publisher's Weekly. Apparently they publish book reviews. They published a review of my book. With a star next to it. I have been remiss, yard-apes. Tesseracts Thirteen, the anthology of fearful fables edited by Nancy Kilpatrick and David Morrell, has been out for a month, and it was only last week that I posted a sample of my story "The Radejastians" on The Devil's Exercise Yard. When Tesseracts Eleven came out, I put up "Swamp Witch and the Tea-drinking Man" months before the book came out. Same deal for "Wylde's Kingdom" and Tesseracts Twelve. So last week, I put up a little bit of "The Radejastians." It is right here. Perhaps it will persuade some of you to read the rest. Which is available in Tesseracts Thirteen, edited by Nancy Kilpatrick and David Morrell. ... that being the annual outdoor book/magazine/street food festival that happens this Sunday at Queen's Park Circle in Toronto - not the sly rumor. I'm going to be there. At CZP's booth, which is #325 (don't worry, they have maps! ), trying to convince passing bibliophiles to pick up a copy of Monstrous Affections. I'm not going to be there all the run from 11-6 this coming Sunday September 27. But I'm going to be there for most of it. And the book will be there the whole time. Unless all of you reading this show up before 2 and buy them all. Yes, you read that right. We're having a flash fiction contest, Bob Boyczuk and Claude Lalumière and me. It's part of an ongoing attempt to 1) find and promote new writers of extraordinarily short fiction and 2) get our ChiZine Publications collections of short fiction in front of said writers. The rules of the contest are spelled out here, but here's the gist: We're looking for really short stories, and we'd like them to be less than 300 words. I myself have never written a story that short, and am not convinced it is even possible. My story The Mayor Will Make A Brief Statement and Then Take Questions is just under 500 words, and it barely makes any sense at all. But I am willing to be proven wrong, as long as the story actually comes in at less than 300 words (we're going to count) and shows up before November 30, 2009. The winner and second and third place entries see their stories published on the CZP website. The winner gets all our story collections: my Monstrous Affections; Claude's Objects of Worship; and Bob's Horror Stories and Other Horror Stories. Second and third place winners get to pick the one they think they'll like best. So get writing, yard-apes. There's not much time between now and November 30. Just got back from a lunch-time trip to The World's Biggest Bookstore in Toronto. And I am mighty pleased to report that the story collection of which you've heard so much, Monstrous Affections, is on the shelf there. 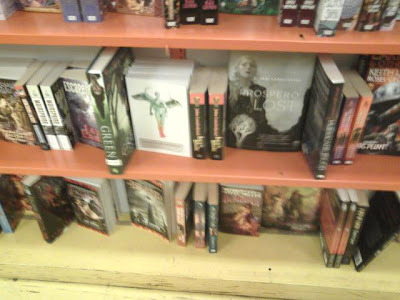 To be specific, four very-recently-signed-by-the-author copies are there, in the Science fiction/Fantasy section (apparently there is a cataloging issue that prevents it from being shelved in the Horror section, where it might do better). But no matter: Mortica, the bookseller looking after the department, got me to sign copies, and also the lone copy of The Claus Effect there. And we had a talk about vampire fiction and the relative virtues of Christmas and Halloween and just exactly how cool Erik Mohr's fantastic cover was. And I believe I have erred in linking Morticia to Jessica's blog. But I still want to link to Jessica's blog on sf at the World's Biggest Bookstore. And so I do. Right here. 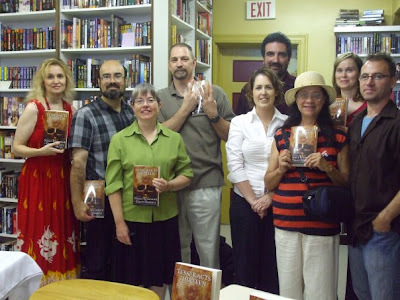 The launch of Tesseracts Thirteen - the scary-story edition of the long-running Canadian sf anthology series - was, by all accounts, a shrieking, quivering success yesterday. There was a huge crowd of authors - a somewhat larger crowd of readers (always a good sign at these things) - and a healthily-diminishing stack of books. ... and for those who can't make it, to Bakka Phoenix books, at three, may I present some John Adams. With Lego. No, it's not a boat, or a rocket, or a tirade. Tesseracts Thirteen is the latest edition of the long-running sf anthology series for and by Canadians, and when I say it launches I mean that there is a big book-selling party in its honor, and it's happening this Saturday. We've spoken of this before in the Exercise Yard, so I'm just re-iterating for those yard-apes who are late to the game. The launch takes place at 3 p.m. at the Bakka-Phoenix bookstore in Toronto. It's located at 697 Queen Street West - just past Bathurst. I'll be there, perhaps reading from my story "The Radejastians." Others will too: namely, Kelley Armstrong, Alison Baird, Suzanne Church, Michael Kelly, Jill Snider-Lum, Andrea Schlecht and Edo Van Belkom. When I say John McDaid, I mean the John McDaid who blogs tirelessly about Rhode Island politics, who writes science fiction so well he won the Theodore Sturgeon Award for short fiction with his first sale, "Jigoku no mokushiroku", in 1995, and with whom I hang out for one week a year at the Gibraltar Point Centre for the Arts on the Toronto Islands. When our mutual friends Cory Doctorow and Alice Taylor got married last year, John wrote them this story, (Nothing But) Flowers, and you can read it for free. Yesterday, he also gave me and my story collection Monstrous Affections a very kind shout-out on his blog, which you can read right here. Monstrous Affections, the story collection of mine of which you've heard so much, is now available for pre-order at ChiZine Publications*, which is the most righteous way to pre-order the book. You can click right here, make the necessary arrangements, and the book will be delivered to your home / business / anonymous post office box / loved one's domicile, in October. ChiZine's making all of their books available for pre-order right now, so if you want to buy 'em all, you can click right here and do that too. * Yes, yes. I know two posts back, I said it wouldn't be available until October 1, after having originally said it would be available September 1. We're all entitled to a couple of mistakes and mistaken corrections of those mistakes now and then. We're also entitled to get it right once in awhile. 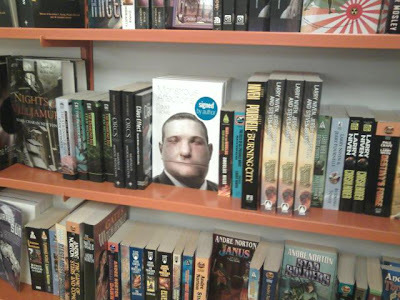 Actually, it's been in bookstores for a little while unofficially. But now the first-ever terror-themed Tesseracts is officially out from EDGE Science Fiction and Fantasy Publishing. 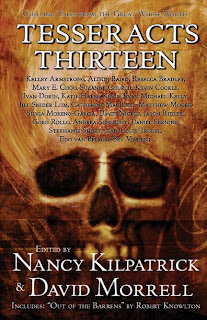 Editors of Tesseracts Thirteen are Nancy Kilpatrick and David Morrell, and contributors include me among others. There'll be a launch in Toronto September 12; we already spoke of that, one post back. We will do so again, closer to the date. We three ate lunch outside in the springtime. There was a picnic table under a small tree, well out of sight of the loading docks, and it is there we met: Viktor and Ruman and I. We had all come from the old country, the same old country, and I suppose that marked us... not in the same way, but as the same, all the same. And it ends up worse.